FOR THOSE THAT NEED THIS TODAY! Long ago when the world was young, an old Lakota spiritual leader was on a high mountain and had a vision. In his vision, Iktomi, the great trickster and teacher of wisdom, appeared in the form of a spider. Iktomi spoke to him in a sacred language that only the spiritual leaders of the Lakota could understand. As he spoke Iktomi, the spider, took the elder’s willow hoop which had feathers, horse hair, beads and offerings on it and began to spin a web. He spoke to the elder about the cycles of life…and how we begin our lives as infants and we move on to childhood, and then to adulthood. Finally, we go to old age where we must be taken care of as infants, completing the cycle. All the while the spider spoke, he continued to weave his web starting from the outside and working towards the center. He said, “Use the web to help yourself and you people to reach your goals and make use of your people’s ideas, dreams and visions. The Lakota elder passed on his vision to his people and now the Sioux Indians use the dream catcher as the web of their life. It is hung above their beds or in their home to sift their dreams and visions. The good in their dreams are captured in the web of life and carried with them…but the evil in their dreams escapes through the hole in the center of the web and are no longer a part of them. They believe that the dream catcher holds the destiny of their future. You may want to get a dream catcher for your self and capture your visions from Spirit. 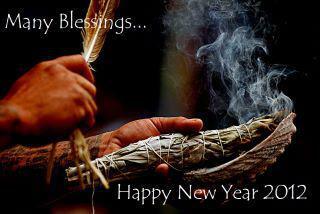 New Year Prayer and Blessing! Let the smoke pass to each their blessing and do away with all sorrows and unhappiness, fill their homes with love, and the light of your wisdom. If any be sick cure them if sad make them happy if they have needs fulfill them. Protect them from all evil. Please Father Keep them well in good health give them long life and wealth. Give them all your love as they love you. They can give testimony to your power and mercy, and most important your love. Oh Great Father in heaven I love you with all my heart as I love my brothers and sisters all. I am your servant and theirs. I ask for only one thing give me Strength to keep going on doing as I do on the Red Road. Amen, Amen, Amen.